First in a series on the representation of cultural property in popular culture. Cultural property is generally defined as artifacts, artworks, texts, or historic locations, important to a nation, a people, or to humanity as “cultural heritage.” In the modern world, places or objects designated as cultural property can serve many purposes. They attract tourists, educate the public, stimulate research, and inspire artists. In cinema, on the other hand, archaeological sites and historic venues exist primarily to add interest to the background of a story. The courts of the Forbidden City or the canals of Venice make striking locations for chase scenes and gun fights, while major museums such as the Louvre or London’s National Gallery are suitable settings for romance or covert meetings. Occasionally the museum, historic site, or work of art does play a more central role in the plot of a film. Unfortunately, many of the qualities for which cultural property is treasured in the real world hardly seem to matter in cinema. Scripts rarely include any serious consideration of art’s aesthetic or historic value. According to the movies, artworks and antiquities exist to be stolen, fenced, utilized in arcane rituals, or blown up. Another consequence of cinema’s emphasis on the monetary value or mystic power of art and artifacts is an erosion of the idea that art has real, intangible worth that can be neither quantified nor monetized, but which nevertheless renders it essential to human civilization and happiness. The majority of films about things or places regarded as cultural property follow one of three basic storylines: the heist, the treasure hunt, or the righteous return. Later articles in this series will address both the ‘treasure hunt’ film genre, with its dramatization of the pursuit of archaeology or art history, and the ‘righteous return’ plotline, which has often been inspired by real-life restitutions to individual owners of art stolen by Nazis. This first article takes for its subject the heist film, and its implications for the public’s understanding of cultural property, art, and the law. The art-heist has become a standard plot in cinema. Although they are less popular destinations than banks or casinos, museums have had their share of visits from charismatic thieves. Topkapi (1964), How to Steal a Million (1966), and The Thomas Crown Affair (1999) are just a few of the many films focusing on the museum, not as a venue for art appreciation and public education, but as a target for a burglary. The theme’s popularity endures; this year, Ocean’s Eight will follow a team of thieves as they attempt to steal a necklace during the Metropolitan Museum of Art’s annual gala. An art heist narrative is, at the most basic level, a story of an object moving in space, from one location (e.g. a museum) to another (the thief’s hideout). The difficulty, danger, and profitability of this transfer is what gives interest to the film. Almost invariably, the history, meaning, or beauty of the artwork in question is entirely irrelevant to the plot. In art heist movies, the art functions as what Alfred Hitchcock called a “MacGuffin,” an object whose sole purpose is to be sought after by the movie’s characters. The MacGuffin drives the plot forward, but its particular properties (apart from its desirability) have no effect on the film’s events. The MacGuffin is interchangeable, its nature arbitrary. The irrelevance of the specific qualities of artworks to their importance in films may be reflective of a general lack of public interest in the fine distinctions between artifacts drawn by connoisseurs, collectors, and curators. 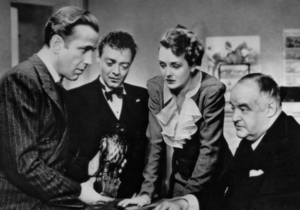 The example par excellence of the film MacGuffin is arguably the eponymous statuette in The Maltese Falcon (1941), an object whose inexplicable desirability not only drives the film plot but mystifies the audience up until the end. We finally learn that the bird in question is a jewel-encrusted, golden sculpture dating to the 16th century. The importance of the Falcon as a historical artifact, or the idea that it might belong in a museum, never comes up. Curiously, neither does the Falcon’s monetary value explicitly motivate its pursuers; their motivations may be pecuniary, but are never spelled out as such: they want it because they want it. The inexplicable yet imperative desire which impels Gutman and his coterie to pursue the Falcon drives the plots of many heist films. “A Monet lover,” is the reply, and that, as far as motive goes, is that. 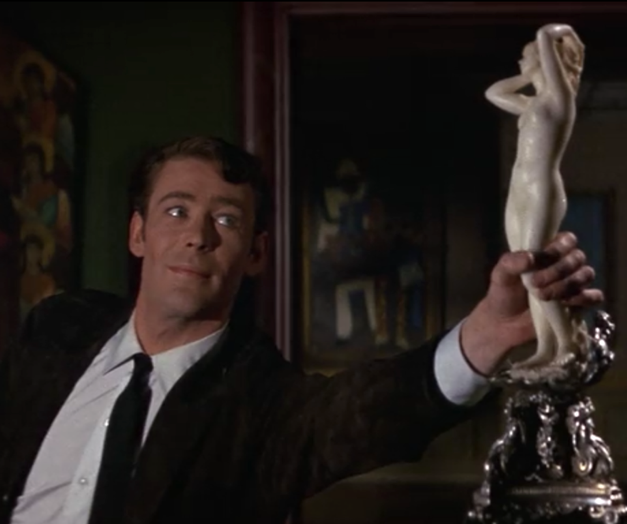 In How to Steal a Million, the wealthy American Davis Leland becomes obsessed with the “Cellini Venus,” a diminutive marble statuette. He first tries to persuade the owner’s daughter, Frenchwoman Simon Bonnet, to sell it to him. When she refuses, he proposes marriage, in a transparent attempt to get at the statue through her. Finally, after the statue has been stolen, he attempts to persuade his friend de Solnay, an art dealer, to help him get to it before the French police do. To love art, according to cinematic convention, is to be obsessed with it, to succumb to a sick covetousness which may drive the ‘art lover’ to any degree of devious, illegal, behavior. The objects of their adoration cannot be legally bought or sold, cannot even be publicly displayed; they are private idols, suitable only for secretive veneration in the dead of night. Possessions without purpose, economic value, or even social cachet, the coveted artworks in these films ultimately amount to so many dirty secrets. 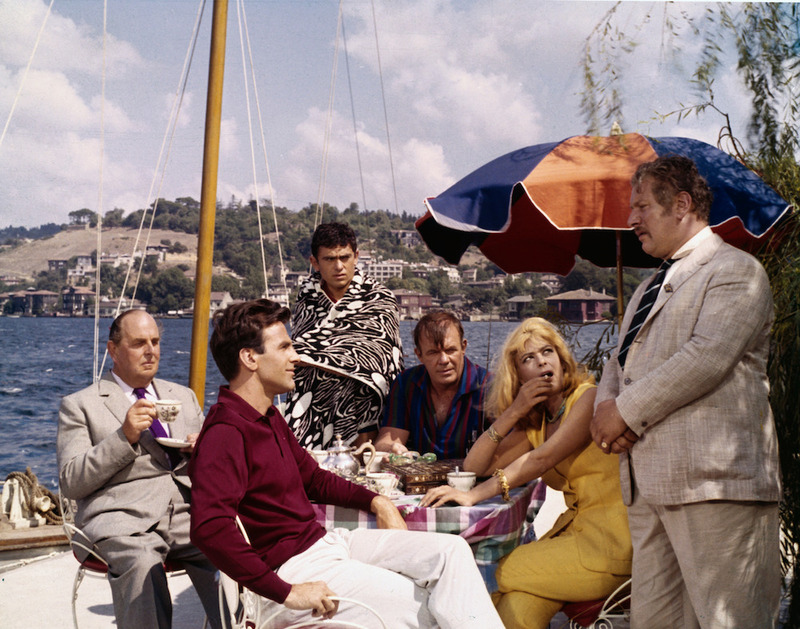 Topkapi (1964) with Melina Mercouri, Maximilian Schell, Peter Ustinov, Robert Morley, Gilles Ségal, Jess Hahn. In reality, of course, most art collectors are deeply concerned with the legal status of their art works. Today, an art collection without documentation is worthless for resale, and impossible to donate to a museum. Building a public legacy, receiving community accolades, and even getting a tax deduction are out of the question. Films do not show this side of collecting or the market; legitimate auctions are less exciting than midnight larceny, and the more nuanced motivations driving real art collectors are more time consuming to explain than obsession. Although the heist film hero’s desperate impulse to possess the desired object is simple to articulate, it can be difficult for audiences to sympathize with. 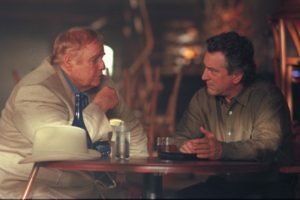 Rather than take the time to try to explain the protagonist’s passion to the audience, or to educate them into likewise appreciating the work of art, most screenplays utilize a simpler method of communicating an artwork’s value: money. 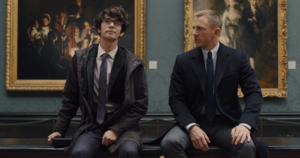 More often than not in ‘heist’ films, a museum employee, security guard, or passing visitor will audibly comment on the artwork’s monetary value early in the film, ensuring that the audience knows that, however incomprehensible the hero’s obsession may be to them, there is some rational foundation for his or her actions. Often, the plot of the typical art heist film is truly indistinguishable from that of the bank robbery. A good example is the 2001 heist film The Score, in which the target, a jeweled French scepter, is treated as a placeholder for the money some unscrupulous future collector will shell out for it. A similar dynamic applies in Entrapment (1999), in which the hero-thieves have no interest in the artistic value of their targets. The two versions of The Thomas Crown Affair use the two kinds of theft interchangeably. The original, released in 1968, revolves around a master criminal who pulls off a bank robbery, while in the sequel, the anti-hero steals a Monet from the Met. The classic art heist film How to Steal a Million (1966) places the profitability of art dealing (or theft) front and center. Not only the film’s title but the first scene (in which we observe an alleged Cezanne painting at auction) emphasize the vast sums to be earned in the art trade, licit or illicit. In a twist on the usual narrative, most of the major artworks featured in the film, including the heist’s target, the “Cellini Venus,” are forgeries. Because the Venus is a fake, the reverence it inspires in characters ranging from a museum director to a pair of priests, comes across as farcical at best. Their mistaken belief in the fake’s authenticity highlights the snobbery of those who revere iconic artworks in real life, and undermines the notion that a love of art either instills or derives from some refined sensibility. So much, then, for personal motivations. In the real world, however powerful art collectors may be, they are more often than not foiled in their efforts to acquire the works which they covet, not by advanced security systems or double-crossing cat burglars, but by export restrictions and increasingly constraining laws. Major collectors and museum trustees, like most folks, would make poor criminals; they use checks to buy things and they don’t shop on street corners. The supposed illegitimacy of the art trade set forth in the media, is largely a matter of critics (and prosecutors) attempting to apply newly-formulated legal standards to decades-old transactions that were considered legitimate at the time. Nationalism, like connoisseurship, plays a very limited role in the heist film. A theft is a theft, and whether it violates personal mores or cultural property laws is immaterial to the thieves and to their pursuers. 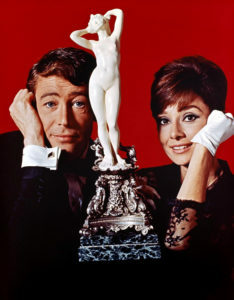 As Kasper Gutman says in The Maltese Falcon, “you might say it belonged to the King of Spain, but I don’t see how you can honestly grant anybody else clear title to it – except by right of possession.” The inalienability of ‘national treasures’ may be key to the present cultural property debate, but it rarely figures in the heist movie. One exception to heist films’ silence on the nationalist aspects of cultural property is How to Steal A Million, in which a French museum curator tells Charles Bonnet, the owner of the so-called Cellini Venus, “I thank you on behalf of France itself for never letting this treasure leave the country.” The Venus is considered a French national treasure, although Cellini was an Italian artist who worked only briefly in France, and it is never implied that the statue was produced in the country or commissioned by a Frenchman. How to Steal a Million dramatizes many aspects of the real art market: the sky-high prices paid for works by celebrated artists, the possessiveness felt by collectors, national governments, and mere admirers of artworks, and the agony of curators when they fail in their duty of care towards an object. Yet it treats all these matters as comical – the heartbroken museum director, the desperate American collector, and the enthusiastic crowds are all the dupes of an art forger. The film renders the entire high-end art world absurd; and in many ways it is right to do so. However, art heist films do have their real-life counterparts. On January 3rd, 2018, two pieces of jewelry were stolen from an exhibition at the Doge’s Palace in Venice. The items were from the collection assembled by Sheikh Hamad bin Abdullah Al Thani and now owned by the ruling family of Qatar. Though not themselves antique, the stolen items were on display as part of an exhibition of primarily 15th to 18th century Mughal jewelry from the Al Thani collection. The jewels are said to be worth millions of dollars, and the heist was allegedly accomplished in broad daylight by two thieves posing as visitors to the exhibition. It is hardly surprising that Italian reporters described the feat as “movie-worthy,” or that this catchy phrase has since appeared in the headlines of multiple articles on the theft. Sheikh Hamid bin Abdullah Al Thani and Queen Elizabeth II at Ascot, 2014. 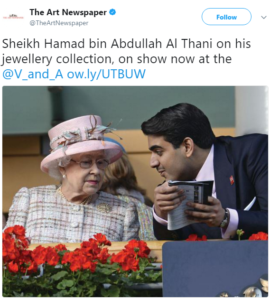 Unless the Venice thieves are jewelry fanatics, like the emerald-obsessed thief in Topkapi, the Al Thani pieces may be broken apart, and their gems sold off individually. The myth of the art-infatuated cat burglar, like that of the unscrupulous private collector who cares only for possessing the desired object, obscures the real fate of many stolen artworks, which are sold for a tiny fraction of their actual value, or even destroyed by the thieves, in an attempt to render documented works unrecognizable or escape arrest when police catch up with them. Heist films continue to perpetuate the idea that art collecting is a rich man’s hobby or a fanatic’s unhealthy obsession, that stolen art can be easily fenced, and that robbing museums is a victimless crime, rather than an assault on a public institution. Heist movies are not necessarily bad films – many are extremely entertaining, dramatically compelling artworks in their own right – but they do not tell the whole story.